Build and Erupt Volcano Kit. $13.95 at scientificsonline. Safer than videos. I cleverly had a niece and nephew (twins) five years before I had Midgets of my own. I arranged things this way so I could make all the parenting mistakes on someone else’s children. You will surmise, however, from the comment my sister left to yesterday’s post about The Great Spanish YouTube Disaster, that my past mistakes were simply the starter course for the main ones later on. Now, I could claim that she’s been addled by reading and rereading all those old National Geographics (see Saving the World, One Stick of Secret at a Time): maybe she just has volcanoes on the brain. But Tom Waits admitted a few days ago on NPR’s Fresh Air that he hoards them too, and he seems just fine. And besides, it would be a deliberate lie, and I like to keep the lies in this blog to indeliberate ones. And so I will relate the short, sad story. As Husbot likes to quote someone whose name I can’t conjure at the moment, “Either be a wonderful example or a horrible reminder.” So let this brief and fiery tale stand as a horrible reminder. I just wish that I’d remembered it. There we were, vacationing on the balmy shores of Maui, my mother, The Guru, my sister and her twins, Sbot and Cbot. The twins were actually 2 1/2, not 4 1/2. And Sbot was endlessly curious about volcanoes. “Bolcanoes,” I believe, was the word he used. That should have been a sign: beware of that which you cannot yet pronounce. A great puff of smoke. A great wall of boiling red magma. Huts in the foreground. Black smoke rising off fire that toppled palm trees as it advanced toward the huts. On either side of me, Sbot and Cbot’s eyes were round as lava tubes. I frantically pawed for the “stop” key, then scurried to get the frozen image off the screen. No, I assured him. No, no, no. Here is a better video, I said, searching for something that looked more benign. But really, are volcanoes ever benign? I figured maybe they were benign enough if they are deep in the ocean. I found a clip of an underwater volcano and rolled it with a sigh of relief. “But where’s the fire?” asked Sbot with disappointment, watching the air bubbles rise through the darkness, completely unimpressed. I tried again. Found a clip. Hit play. There was an eruption, excellent. There was….oh, screaming townspeople, running from a wall of ash. Where is that “stop” key when you need it? Their mother took it remarkably in stride, as she admirably does most things. It was several days before Sbot expressed interest in bolcanoes again, but by then, my teaching privileges had been, understandably, revoked. 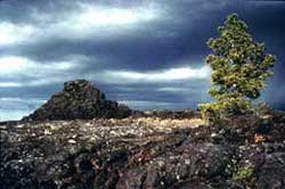 Six months later, back home in Idaho, their father took the twins on a picnic to Craters of the Moon National Monument. A special treat, just him and the kids. 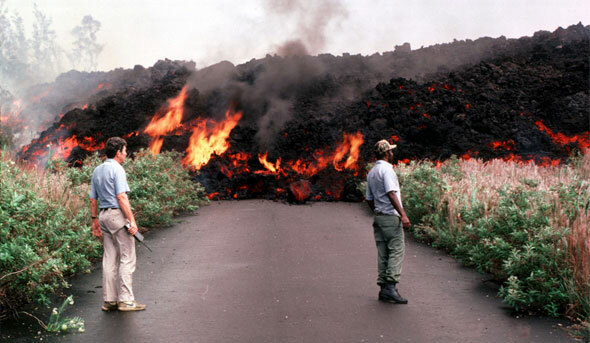 Sbot got one look at the lava-strewn landscape and wanted to go home. A year later, The Guru helped them make a version of the Build and Erupt Volcano. It’s simple: You build a cone out of instant paper mache mix, let it dry, and paint it volcanoishly. Then you put a bowl of baking soda in the hollow cylinder you’ve left at the center. You pour in vinegar. Voila: instant eruption. Steam, bubbles, the whole crazy thing. It was a great hit. So my sister was right: Sbot survived my aunting blunder. Mbot and Gbot will survive my parenting blunders. But will I? With every parenting mistake I make, is the number of possible mistakes left to make reduced? Or, like the universe, is the number always expanding? This entry was posted in humor, toddlers and tagged children, dailypost2011, Hawaii, humor, life, moms, Volcanoes by Betsy Andrews Etchart. Bookmark the permalink.